Reggie Darling: Reggie's Reflections on "Ivy Style"
Reggie's Reflections on "Ivy Style"
Boy and I spent this past weekend running around New York attending exhibitions and shows, shopping for clothes, and eating out in expensive restaurants. We had a lovely time, Dear Reader. One of the reasons we decided to stay in the city instead of making our usual trek north to Darlington House was to take in the "Ivy Style" exhibition at the Museum at FIT. As most of the readers of this blog likely know by now, FIT has mounted an exhibit that chronicles the evolution of a style of men's clothing, originally known as the "Ivy League Look," from its origins on the American campuses of Princeton, Harvard, and Yale (among others) in the first decades of the twentieth century up through the present day. 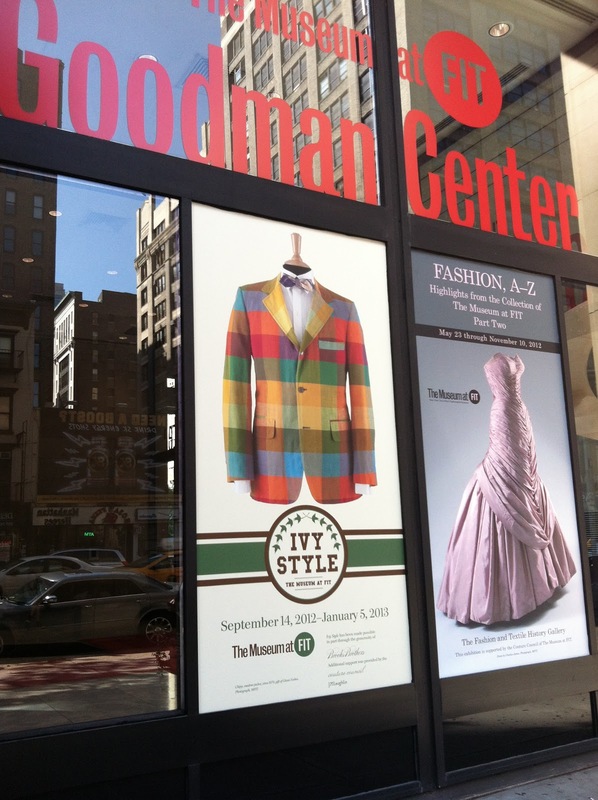 For those of us who are interested in clothing, style, and social history (and who isn't?) the exhibit is more than worth a visit. 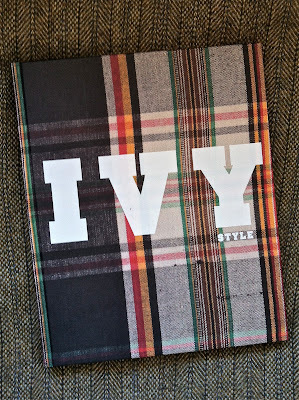 There has been much written about the "Ivy Style" exhibit in the media and on the men's "trad" clothing blogs, and it takes its name from one of the most popular of those blogs, written by Christian Chensvold. Mr. Chensvold was involved in mounting the exhibit and is a contributor to the show's entertaining, thought-provoking, and surprisingly academic catalog. Boy and I were invited to attend the opening of the exhibit by Thomas Cary of the Cary Collection, who lent many of the accessories featured in the exhibit, but we were, to my disappointment, unable to attend. In any event, I very much wanted to see the exhibit, and I am pleased that I did. 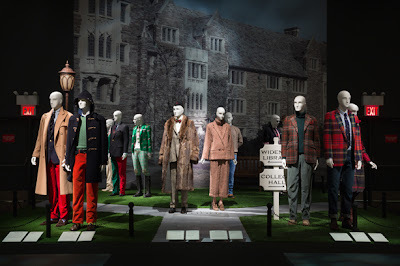 I am heartened that the style of men's clothing featured in it is considered worthy of a curated show at FIT and that there is a growing re-appreciation for the classic American Ivy League men's style in today's fashion circles. 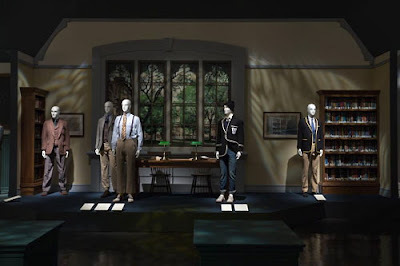 Of course Ralph Lauren has been mining this particular vein for decades, but I am hoping this exhibit, along with the chorus of bloggers who have been championing Ivy (or Trad) style in recent years, will prompt yet even more interest among young men in this country in appreciating the integrity of dressing well again. Hey guys, it's actually cool to wear a jacket and a tie on a weekend! The exhibit includes a catalog/book of essays by luminaries in the industry that is chock-full of photographs and illustrations from vintage periodicals and sales brochures. It is a visual delight! 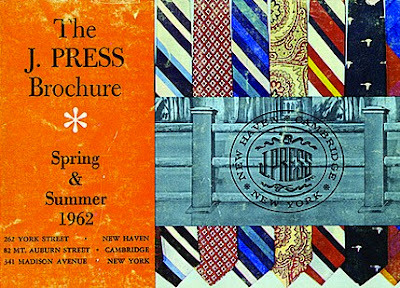 I've flipped through the catalog/book (published by Yale University Press) a couple of times, mainly focusing on the photographs for now, although I did take the time to read Mr. Chensvold's enjoyable interview of Richard Press, the grandson of the founder of J. Press—the venerable and iconic men's clothing store in New Haven, Connecticut, that did much to popularize the Ivy style. The exhibition is divided into a half a dozen or so themes, ranging from "the Quadrangle," to "the Dormitory," and my personal favorite, "the University Shop," shown in the preceding photograph. "For God, For Country, and For Yale"
While I certainly enjoyed attending the exhibit, I had the eerie feeling while doing so that I was spending my time there staring at my own navel. It was all very familiar to me, and much of the clothing on display could have come from the closets and cupboards of the men in my own family. 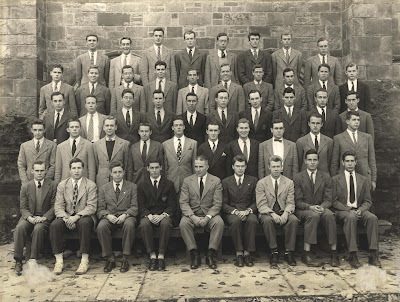 My roots in the Ivy League go back a number of generations, mostly at Yale, where my grandfather Darling, my father, and I and my brother were all fortunate to attend as undergraduates. It was at Yale that I came to fully understand the true allure and iconographic significance of the Ivy style of dressing. 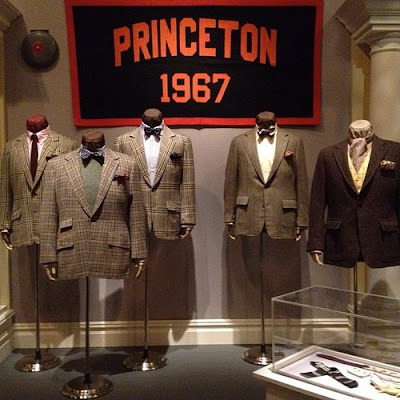 While my prep school experience at Saint Grottlesex prepared me for Yale (in many ways), it was only upon my arrival in New Haven that I came to truly appreciate the splendor of traditional Ivy League dressing. 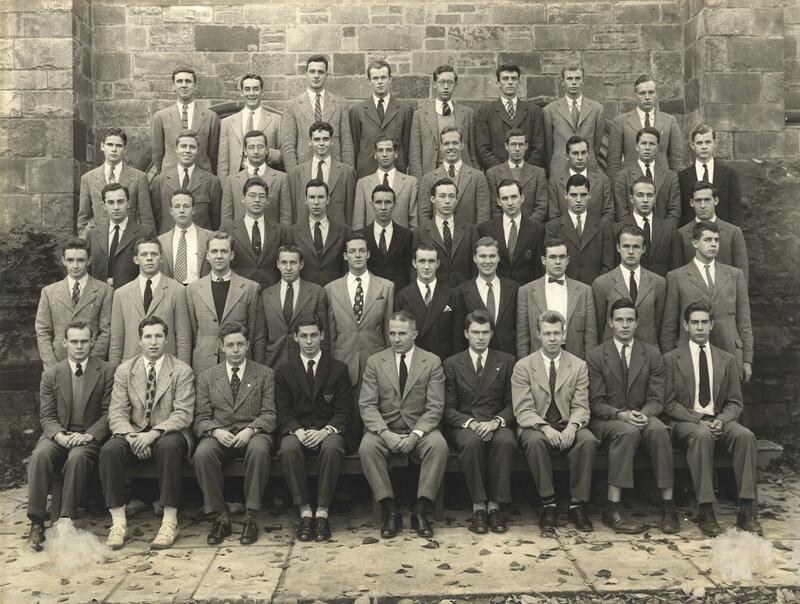 I came to Yale as a boy, and I left it as a man. 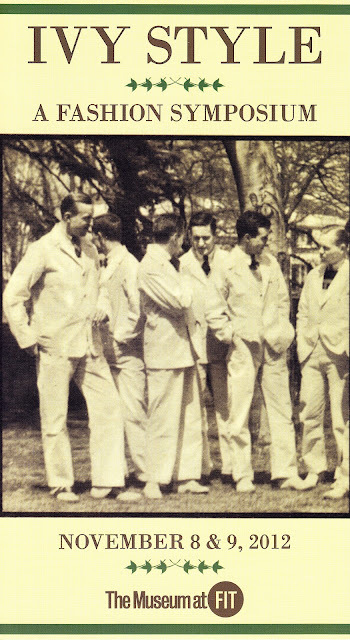 When my father was an undergraduate at Yale in the early 1940s, he was clothing obsessed. Letters written at the time to his parents in Grosse Pointe (which my grandparents saved and which I read many years later) were full of entreaties from him for yet more funds to purchase the clothing and sartorial accessories he felt were imperative in order to fit in with the smart crowd with which he ran at Yale. 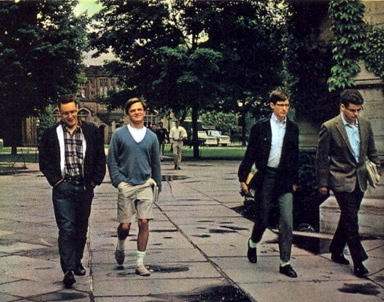 For my father's Yale 25th reunion, held in June 1969, I remember that all of his returning classmates were given blue-and-white striped blazers similar to the ones shown in the preceding photograph. However, the blazers handed out were made of paper, like the Andy Warhol soup can paper dresses that were a craze at the time. What I would give to have one of those blue-and-white striped paper blazers today! One of my most treasured possessions is my Grandfather Darling's blazer from the English public school he briefly attended before Yale; I am showing it in the previous photograph. 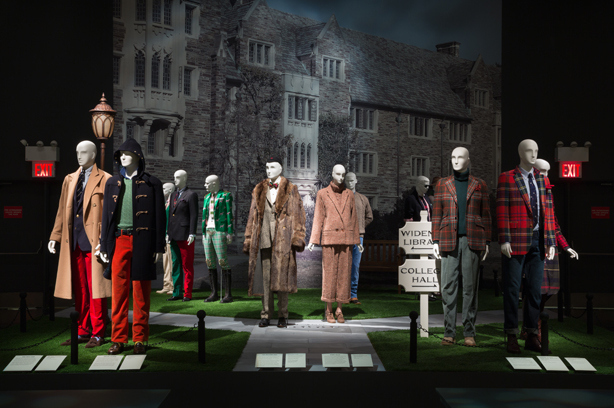 As the "Ivy Style" exhibit notes, much of the clothing adopted by American Ivy League undergraduates in the early twentieth century had its inspiration in England. But it became softer, less military, and less buttoned-up when it made its way to this side of the pond. When I enrolled at Yale in the mid-1970s, the Ivy League look was in its death throes. Even though New Haven still had a number of Ivy style purveyors ringing the campus, almost all of them closed when I was an undergraduate there, with the exception of J. Press (still going strong) and Barrie Ltd. (long-since closed). My father used to let me charge clothes on his account at J. Press from time to time when I was an undergraduate. Nothing crazy, mind you. A sport jacket here, a couple of shirts there, some gray flannels, and a Shaggy Dog sweater or two. Just enough to keep me out of rags, I suppose . . .
My roommate and best friend at Yale, William "Willie" Octavius Koenig IV, and I were among the handful of fellows in our class at Yale who appreciated the old Ivy League look from the 1950s and 1960s, and we spent a lot of our free time (and most of our disposable incomes) at J. Press making pests of ourselves. One of the salesmen there, a fellow named Gabe, used to take us in the back room of the store and let us buy end-of-stock vintage shirts and ties from days gone by. Gabe used to sell clothes to my father, too, whenever he came to town. Willie and our friends used to call J. Press "the Squeeze" in those days, a play on its name and a comment on the injury that frequenting it did to our meager undergraduate bank accounts. I was something of a throwback when I was an undergraduate at Yale. 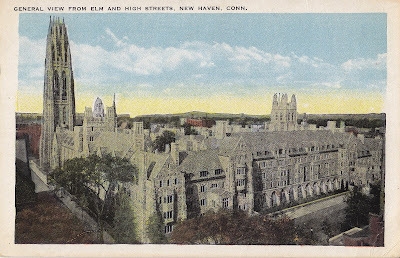 Although I was happy that it had gone co-ed by the time I arrived there, and many of my classmates came from backgrounds different from mine—ones that didn't include prep school educations and legacy Yale histories—there was part of me that wished I had been born at a time when I would have attended Yale when it was still all male and more homogeneous and full of people like me, when people still dressed like the undergraduates shown in the following photograph from the 1950s that appears in the catalog from the "Ivy Style" exhibit. But I didn't, and it wasn't, and they didn't, and that's more than okay with me. 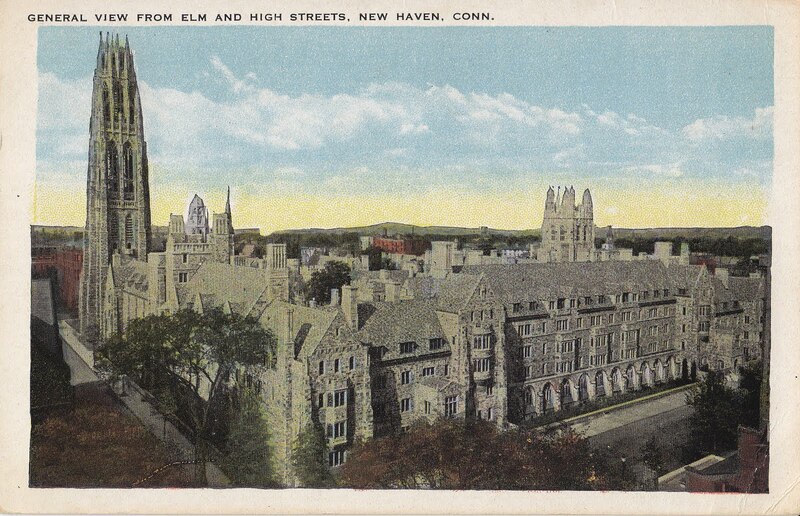 There were still vestiges of that old Yale when I went there, though. Although official dress codes had been abandoned by the university during the previous decade, undergraduate men during my time at Yale in the 1970s were still expected to wear jackets and ties to university-sponsored events, such as receptions at the president's house or athletic dinners. And, as a member of one of Yale's undergraduate singing groups (and a highly social person to boot), I routinely found myself donning a jacket and tie at least several nights during the week. I also owned a tuxedo and a set of tails when I was an undergraduate there, and I had occasion to wear them, too. During my senior year at Yale, when I was a member of the Whiffenpoofs, we spent a week or so traveling with the Yale Glee Club on a Midwestern tour over the Christmas holiday break, visiting places like Pittsburgh, Buffalo, and Detroit. At the end of the tour, during the wrap-up dinner, I was given a gag award for being the "Preppiest Guy" on the tour, much to Willie Koenig's irritation (he felt he was gypped out of that recognition). I wish I still had the certificate—that and a lot of other things from those happy, golden, bygone days . . .
After I graduated from Yale and moved to New York to begin my Wall Street career, I pretty much stopped going to J. Press, even though it had an outpost in the city. I missed Gabe from my undergraduate days, and the more urban, corporate Brooks Brothers seemed to me to be the more appropriate place to outfit myself as a junior banker than my old haunt of tweedy J. Press. It was not until I was in my forties that I found my way back to the Squeeze again. 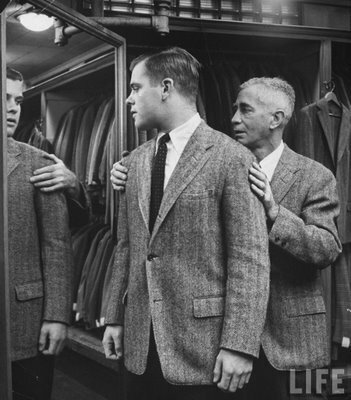 I'll never forget the time I walked into the old store on 44th Street, the one around the corner from Brooks, and how I almost started to vibrate when I tried on the same suits and jackets there that I remembered my father wearing. Here I was, all grown up, slipping my arms into the very same tweed jackets and worsted suits that my father wore when he was the same age as I had become . . .
Not surprisingly, I still mostly outfit myself from the likes of J. 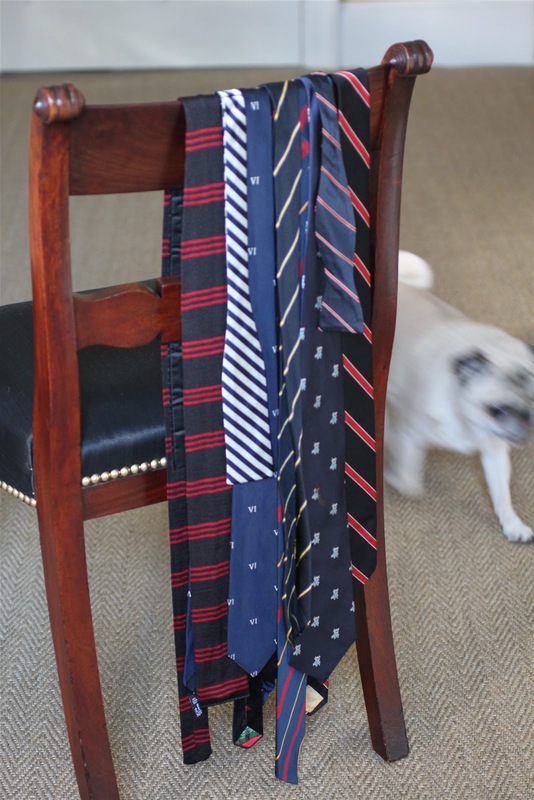 Press and Brooks Brothers. 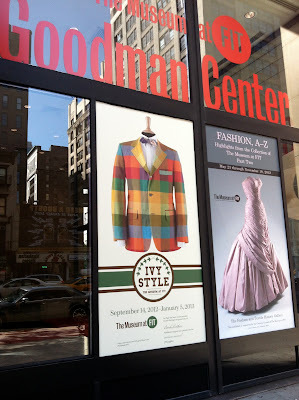 I also shop at specialty stores that sell traditional men's clothing and accessories inspired by the Ivy League style, in some cases updated for a more modern sensibility. I like the look, I feel comfortable in it, and it is one that is appropriate for men of all ages to wear. 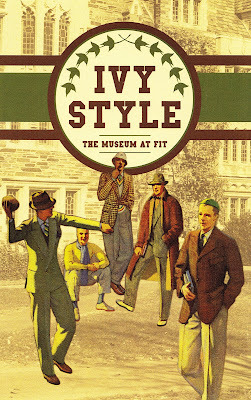 In closing, I very much enjoyed attending the "Ivy Style" exhibition at the Museum at FIT, and I encourage you, Dear Reader, to be sure to see it, too, before it closes in January. 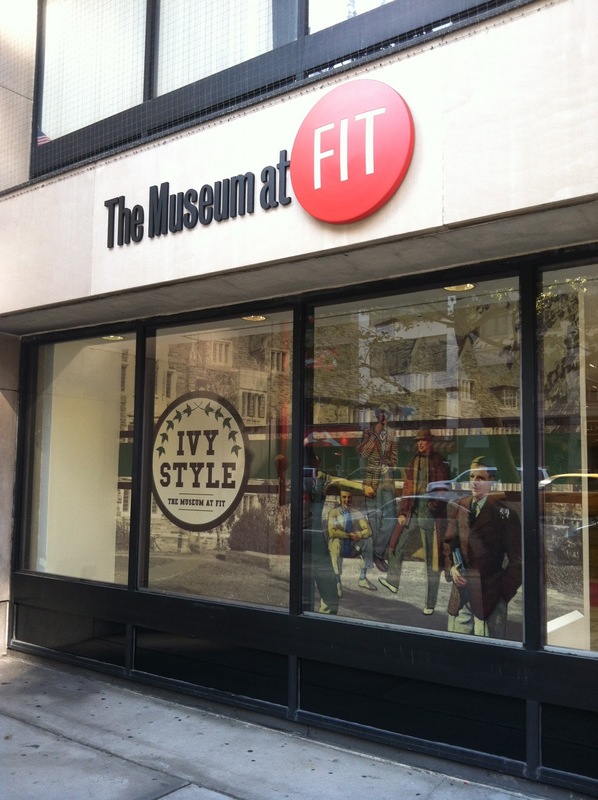 For those of my readers who happen to be in New York in early November, FIT will be hosting a two-day symposium on Ivy Style on the 8th and 9th that is sure to be of interest. My friend and fellow blogger, the highly entertaining and mischievously amusing Maxminimus, is scheduled to appear in the gathering's closing round-table discussion, "Blogging About Ivy," which—I am sure—will be one of the symposium's more memorable gab-fests. Who knows, you just might even run into Reggie there, too . . .
"Ivy Style" will be on view at the Museum at FIT in New York City through January 5, 2013.
we can well imagine you to be the epitome of Ivy Style, not in a way of 'throwback' to the 1950s but more of a 2012 reinterpretation of the look. How it saddens us that most people for most occasions 'dress down' these days since, for us, an event has heightened excitement when glamour is the order of the day [or evening].Thankfully, in Budapest, people do still dress for the Opera and for music concerts and so this, in our view, makes for a more enjoyable occasion all round. The exhibition sounds very appealing and, if only we were closer, we should surely be attending. A glimpse of Reggie......ivy styled or not......who could resist? Oh I should bring my scruffy, handsome, hipster son! And Reggie, you epitomize the real deal. It's not all about the shoes, as you know. It's the code. In great fondness, LPC. Seriously? Reggie and Max in the same place? It would be heaven! Is not a swallow-tailed morning coat,with gray trousers, seen on the right of the image captioned 'Evening Wear', only ever daytime attire? For those who can't see this exhibit, another resource is the book, "Gentleman's Guide to Grooming and Style," written in 2000, perhaps updated, perhaps not. 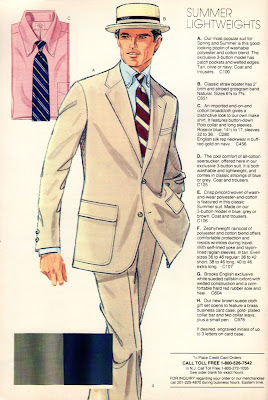 But then again, why update a gentleman's guide to classic attire? 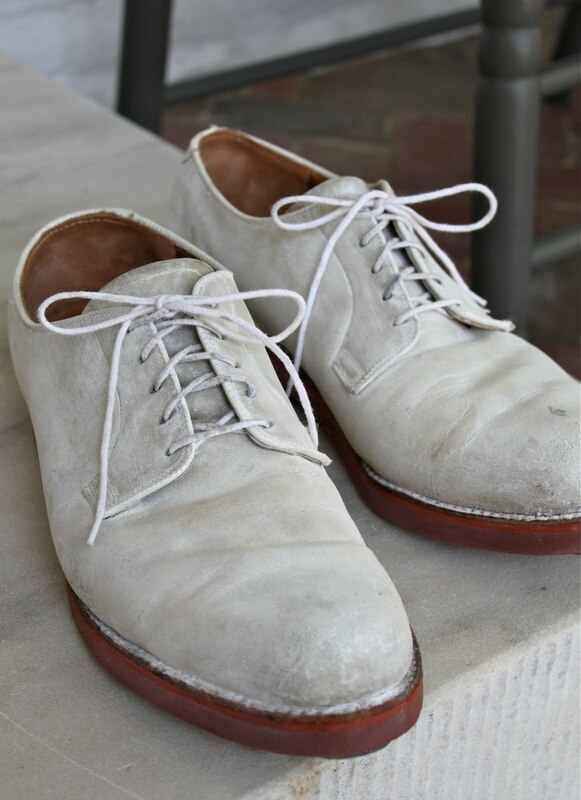 It has good advice for all, including young fellows, such as this: if you only have $300 to spend on shoes, buy one pair. And then it proceeds to name names, from Allen Edmonds to John Lobb. I wish that all young men would read it. It would be such an improvement over seeing them wearing hoodies (with anything, but especially with blazers) and carrying backpacks instead of briefcases. I went to college in the late 60s, and though I was a Fine Arts student at a time when everyone else was dressing down, I always wore a tie. I took some satisfaction in knowing that it was I who was really the rebel! Oh I long for those days; when a gentleman looked the part. I never tire of beautifully made traditional clothing. My late husband wore a lot of Brooks Brothers, Nordstrom, Nieman Marcus, etc. Of course I wish I could attend. Enjoy all of the photos; especially of you being fitted at J Press. Is that why all the fabric mills in this country went out of business or moved else where? Due to lower demand for the fabrics to be profitable lower wages ?? Are there any decent tailors in this country anymore? I like your father, he is the only one not looking to the front in the photograph. I went to a private girls school ..we wore panama hats in the summer and kahki coloured woollen berets in winter. We were of course fully clothed in the appropriate tunics, shirts and ties and gloves. smr: me too, I absolutely adored my school uniform and couldn't bear to get a bash in my Panama hat. Hello Reggie, These clothes were an element that became part of the Ivy aura, which lives on even if these outfits have pretty much been relegated to the realm of costume and history. 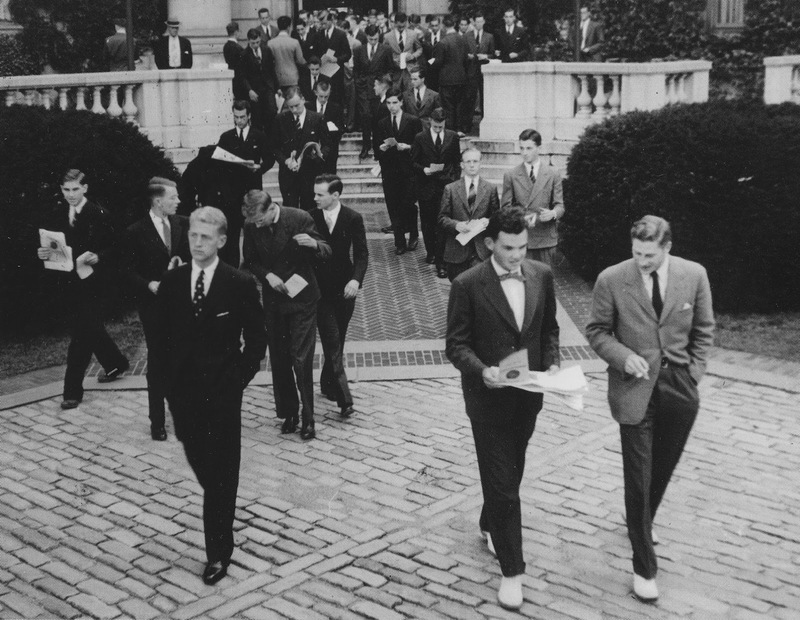 When I was at Yale, it was even a degree or so less formal than you describe, and yet the Ivy Look was never very far away, and it was certainly no surprise to see students walking around dressed like this. Another fantastic post by RD! FIT does a bang up job of mounting it's shows, and I am an alumni of that august institution, we like to think of as the Harvard or Yale of fashion and design schools. Most of my professors had migrated from Parsons years before I arrived! I love the huge amount of images you've dropped into this post. I am esp fond of those from your personal archives! Wonderful review of the exhibit. I especially enjoyed your personal perspective interspersed with the wonderful images. 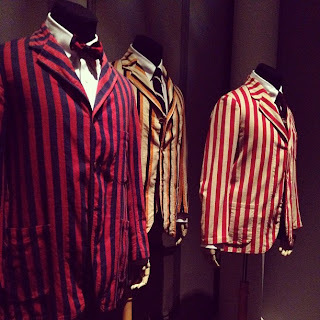 I absolutely love this post, I would love to have had your Ivy League experience, oh I wrote about red trousers this week and linked to you, I'm also ranting about ties today, male standards are dropping, we must fight it on the beaches! 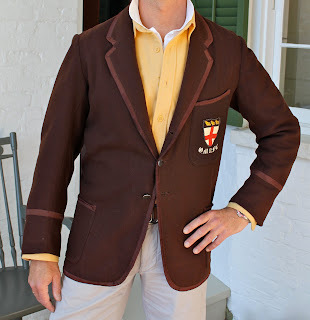 I am mad for your grandfather's prep school blazer! Thank you for this post, it was a fascinating and informative read! It was really interesting to hear your personal take on Ivy League style and how it is so much a part of your family's Yale tradition. I had not heard of this exhibit but if I have a chance to visit New York in the next few months, I will definitely go. 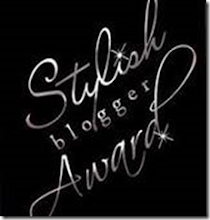 I have just started following your blog after Tabitha's recommendation, looking forward to reading more! As usual, I'm late to the reading. Seems I've little time left these days to write or read blogs. But I'm pleased to have found this...I loved reading it. PS...I kid you NOT. The word challenge for my previous comment was ... "nukaverb h"
Speaking of "Horrid Carnations" . . .